L'hôtel Le cyclope is a 2 star hotel typically African. Its central location in COTONOU you will discover the charms of living in Cotonou for a very affordable price. The hotel offers 25 rooms divided into several categories. 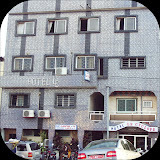 The offer of rooms is any budget for stays for tourism and business stays in Cotonou. The hotel is also the starting point for your tours in Benin. The atmosphere at the Hotel is warm, the welcome is personal and you will be greeted by a smiling staff available.